Dr. John M. Sarbak is always on the lookout for the next great anti-aging breakthrough. He believes it is imperative to make sure that the products we offer at our practice are safe, as well as effective. Designed to achieve and maintain a youthful complexion, our skin care products can also serve as an excellent supplement to our laser treatments or other non-surgical facial rejuvenation treatments. Dr. John Michael Sarbak talks about the VIP skin care treatments that he and his staff offer to their patients – in an effort to sort through gimmicks and fads. The Obagi name has been recognized as a leader in medical-grade skin care products since 1988. 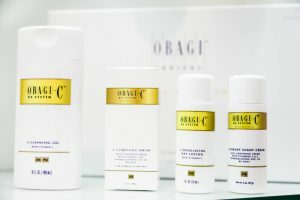 Obagi Medical Products, Inc., now a subsidiary of Valeant Pharmaceuticals International, Inc., uses prescription-strength ingredients to formulate unique products that can refresh and renew the skin. When used in combination with one another, the benefits of these products can be even further amplified. What are the Benefits of Obagi® Medical Skin Care? Obagi® Medical products are designed to operate at the cellular level, stimulating the growth of new, healthy skin. Ingredients used in Obagi® Medical products can include vitamin C, retinol, tretinoin, and hydroquinone. For the common concern of acne, ingredients like salicylic acid and benzoyl peroxide are used to help control breakouts for clearer skin. By following a customized skin care regimen with Obagi® Medical products, most patients can notice significant results in their skin in just eight weeks. When searching for Obagi® Medical products, patients should keep in mind that these clinical-grade skin care products are primarily distributed by plastic surgeons, dermatologists, and skin care professionals. Genuine Obagi® Medical products are only sold by authorized providers due to the prescription strength of many formulas. To learn more information about the skin care products we offer at our practice, or to schedule a skin consultation, please contact our office today.